This sheet will be available soon in 1/32, 1/48 and 1/72 scales. The sheet features both Su-27Ps and UBM1s. You can decorate two models from the five options on the sheet. Here are a couple of nice snaps taken at Baranovichi in 2011. Interesting! Any word about the MiG-23 stencils in 1/32? In der Mache. Voraussichtlicher Liefertermin ist Jan. - Feb.
We're adding some MLD-specific details to the stencil sheet. Should be ready for the printers soon. 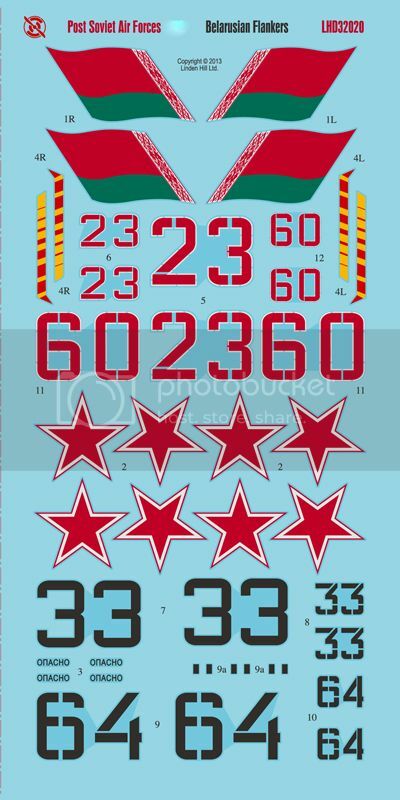 What is the current status of the MiG-23 stencil sheet? Any news whats next in 1/32? The operating budget for the last two quarters was invested in another project. We now plan to have this sheet printed sometime in Q2 2015. Hi, any news on the 1/32 sector? Unfortunately not. The other project is taking much longer to complete. Don't expect anything 1/32 before the end of the year. Anything new in the pipeline in 1/32?